Looking for a great family-friendly day trip? How about visiting an aquarium? They are educational, fun and offer at least some air conditioned relief from those really hot Florida spring and summer days. The first public aquarium opened in the London Zoo in 1853 and the circus giant, P. T. Barnum, quickly followed three years later with the first American aquarium, as part of his established Barnum’s American Museum in New York City. These were actually small exhibits by today’s standards, but thus began our quest to see what lies beneath the ocean. On a bigger scale in Florida, it was 1947 when Newton Perry opened Weeki Wachee Springs. The underwater theater, with just 18 seats, advertised live mermaids and the show amazed crowds, but also offered a glimpse of a world that few had ever seen. Around the same time, Jacques Cousteau was co-developing the aqua-lung which allowed him to explore under water and he went on to publish his most successful book, The Silent World: A Story of Undersea Discovery and Adventure, in 1953. He, of course, ended up being a household name when it came to underwater adventures. Over the years, through innovative people like Perry and Cousteau, we have learned more and more about our oceans and formed a love affair with the magical underwater world filled with an array of amazing creatures. Aquarium display innovations have also continued to evolve with larger tanks and unique viewing platforms. Today they not only allow visitors face-to-face encounters, but hands-on touch pool experiences. Home to the Aqua film stars Winter and Hope of the Dolphin Tale movies, the Clearwater Marine Aquarium is a must if you have a fan of the movie in your family. A great family-friendly educational and entertaining attraction. A large portion of the aquarium facility is outdoors and subject to weather condition cancellations. Plan your visit accordingly. While admission is very reasonable, plan to pay extra for the chance to feed and take photos with the marine stars of the movies. Although not as large as a certain Central Florida marine theme park, Miami Seaquarium also features trained dolphin and killer whale shows. Exhibits showcasing sea turtles, seals, sea lions, and the Florida manatee offer a fun day of exploration. Tip: If you're going to be visiting the Miami area, purchase a Miami Go Card to save on admission to multiple area attractions. Located along the city’s International Drive is Florida’s newest aquarium, SEA LIFE Orlando. Step inside the underwater 360-degree tunnel for an amazing view of sharks and turtles, plus get up-close-and-personal with hard-shell shore creatures the attraction’s Rock Pool area. SeaWorld Orlando is not exactly an aquarium, but the marine theme park has indoor exhibits that offer unique views of penguins, sharks, and turtles – Antarctica: Empire of the Penguin, Shark Encounter, Wild Arctic and Turtle Trek. There is also a Manta Aquarium and underwater viewing of Shamu and dolphins. Tip: SeaWorld Orlando admission is required to visit any of these exhibits. 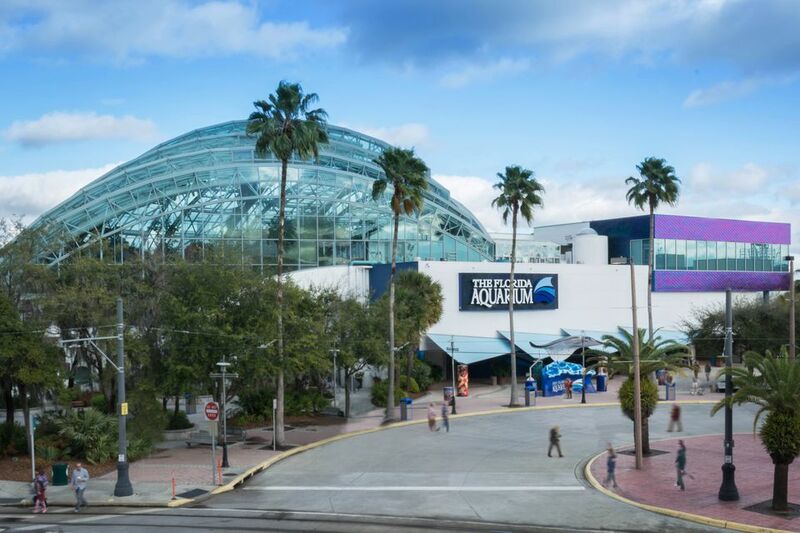 The Florida Aquarium is more than 150,000 square feet of air conditioned educational fun with tanks large and small, including the Coral Reef Gallery which showcases one of the most beautiful and diverse ecosystems in the world, usually reserved for experienced divers. There is also an outdoor two-acre wet-play zone for kids - Explore A Shore. Tip: This is a great place to stay cool while awaiting your boarding time when sailing from the Port of Tampa. Florida’s largest salt water aquarium, with 5.7-million gallons, is located within Disney World. The attraction was initially themed as an underwater exploration base, but was reimagined and renamed as The Seas with Nemo and Friends. Besides the Nemo and Friends ride, it also houses the technically advanced and popular, Turtle Talk with Crush. Epcot admission is required to visit The Seas with Nemo and Friends. This is a Fastpass+ attraction. Reserve a day and time for your visit up to 30 days in advance. Marine theme parks and aquariums have come under fire by animal rights groups that argue inhumane treatment of animals performing in shows. They have also called into question how specimens for exhibits are obtained and displayed. While this will always be a concern, the good they do cannot be overlooked. Their rescue and rehabilitation programs save a large number of animals each year. The bottom line is these attractions all care for the well being of animals and help educate the public.